New color LCD screen 2m transverters! • Frequency Coverage: 144.0-146.0MHz band. • LO frq stability: Low phase noise, 1ppm PDI or optional 0.5ppm AXTAL TCXO's! • Input Voltage : 13.8VDC, +-5%, polarity mismatch, 10A -40dB EMI filter. • Power Consumption : 0.55A on RX, 5.5A on TX @30W out version, 10.5A @50W version. • RX RF mixers : HJK-3H+ by MCL. RX connector: 1x "N" type 2m common TX/RX ANT, or separate 2m RX "N" type connector. BNC type IF connectors, 1X spare "N" AND 1x spare BNC connector. 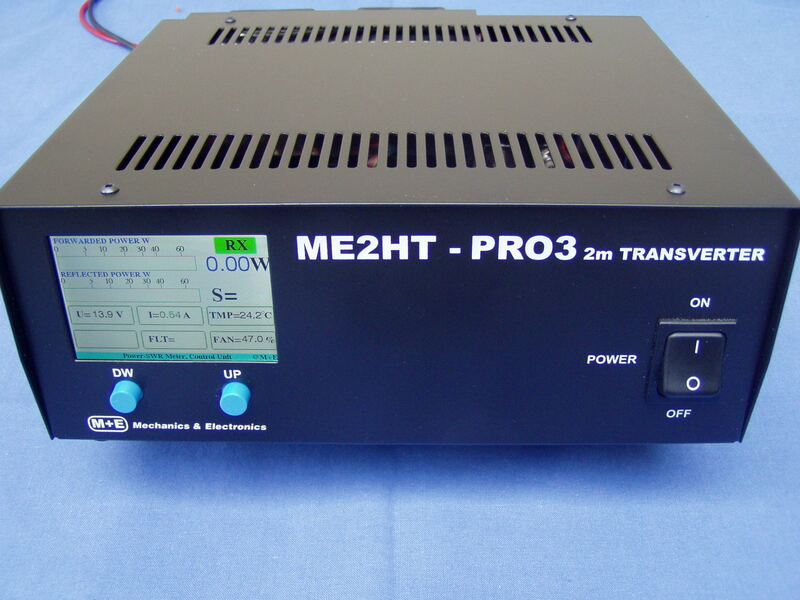 • Power Output: 30W(ME2T-PRO3) or 50W (ME2HT-PRO3) version, continuous carrier. • SWR on IF input : 1:1.1 max. • Emission modes : CW, SSB, FM, FSK. FWD,REV,Watt, TX/RX ,Main voltage,Current,Temperature,fan speed displayed. Optional fan module (2pcs 50x50mm external fan),standard on 50W HT-PRO3 version. Common TX/RX or separate 2m RX connectors.